FriendFeed has got to be one of the most innovative companies around these days. It seems every week, it’s hatched something new with its service. That alone makes it worth being there. Then there’s the interactions. When those are rocking and rolling, it’s a lot of fun. Even a few Likes and comments are worth the experience. Of course, not everyone is engaged enough on the service to fully benefit from that. Which is something I completely understand, by the way. I’ve got three reasons you should be on FriendFeed now. Not for the conversations. Not for the real-time experience. But three reasons that will be valuable to you personally. You likely know the background of much of the FriendFeed team – Google. Yeah, these guys know search. Even more importantly, they know something about how Google manages search. So it comes as no surprise that FriendFeed can rank pretty highly in Google search results. Here’s a favorite example of mine. Alex Scoble (yes, Robert’s brother) is planning his wedding reception. One candidate location for the reception was the Hillsboro Cultural Arts Center. But the managers of that location were not very flexible in working Alex and his fiance. On FriendFeed, Alex posted about the Hillsboro Cultural Arts Center, with some comments explaining why he was not going to use them. It’s not a flattering portrayal of the Center. Well, check out what a search on the Center’s name returns: Alex’s FriendFeed entry is the #6 result. Not something that Center wants in their search results, but a great way for Alex to let others know about his experience with the Center. FriendFeed’s Google prowess shows most strongly in name search results. On this FriendFeed discussion, Mark Trapp noted that his FriendFeed account always ranks higher than his personal site. Well, if you run a search on mark trapp, you’ll also see that his FriendFeed account is ranked #1, ahead of some attorney named Mark Trapp. Without FriendFeed, that attorney would own the #1 search result. And FriendFeed member Brian Chang noted this back in January: “I just discovered that my FriendFeed comes up on the first page of Google search results for my name. I think that’s the first time something of mine has actually done that.” A quick search on brian chang reveals he’s not on the first page, but he’s still there, among a lot of brian chang sites. FriendFeed shows up #3 on a search of my own name. Let’s assume you participate in more than one social media site. Maybe Twitter, Del.icio.us, blog and Flickr. FriendFeed, of course, lets you pipe all of that into its site. If nothing else, having one place where you can search for all your content easily is reason enough. Returning to the search pedigree of the FriendFeed team, there’s a really good reason to have your Twitter account piped in. It makes it easy to find your tweets. As Louis Gray noted last week, it’s much easier to find tweets in FriendFeed than it is with Twitter’s search. On FriendFeed, you’ve got an archive of all your tweets. On Twitter, you don’t. Remember when the bookmarking service Ma.gnolia lost all its users’ data? If you had saved your bookmarks there, you were out of luck. There was no recourse to getting that data out. In a post here, I noted that bookmark service Diigo lets you save to De.licio.us simultaneously. The idea being that you needn’t rely on just one service, in the wake of Ma.gnolia’s data loss. 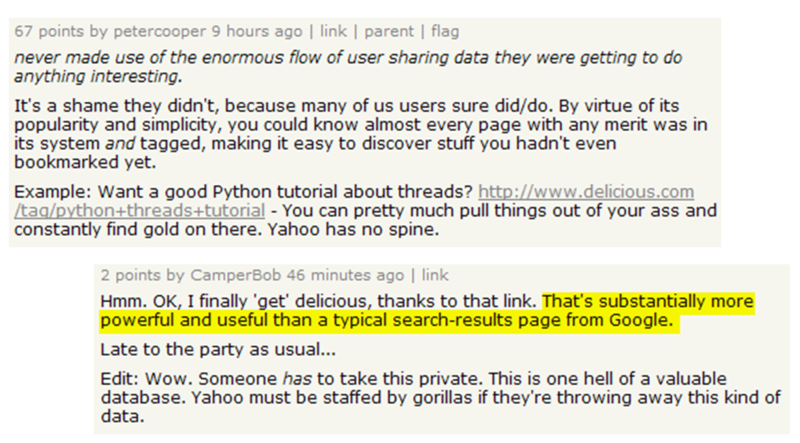 Well, that same notion of mitigating your risk carries over to FriendFeed as well. I pipe all my Diigo bookmarks into FriendFeed. So now I have my bookmarks in three places: Diigo, Del.icio.us and FriendFeed. And when I need to look up one of my bookmarks, where do I usually search? FriendFeed. Probably my biggest use case for FriendFeed is as a tracking platform for various topics I care about. 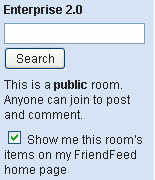 I’ve got a room to track Enterprise 2.0, which I augment with following 70+ individuals from that world. I’ve got a room for tracking my company Spigit, its competitors and the innovation management field. The importance and value of tracking the Web this way is something I’ve discussed here many times. You can visit those prior posts for greater detail on how and why. But I’ll say this. 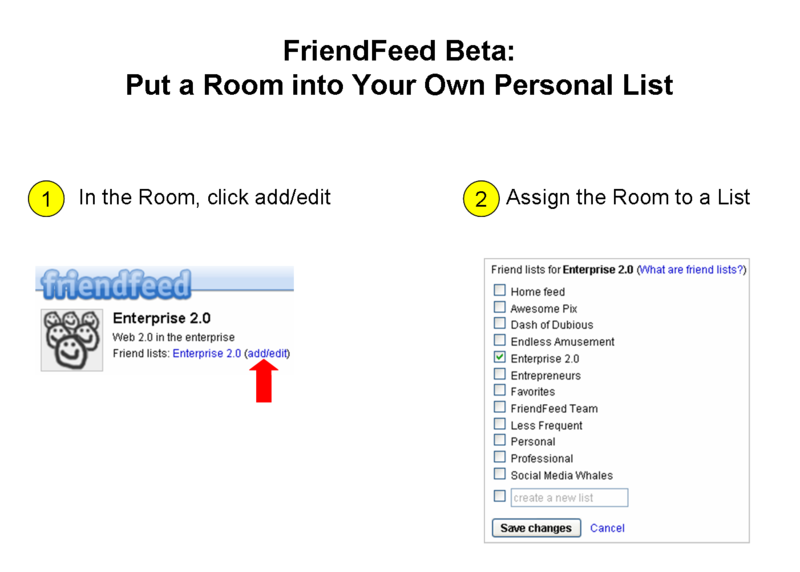 Whenever I need to get up to speed quickly on something, setting up these FriendFeed Rooms and Lists is one of the first things I do. You’d be amazed at how effective they are. And unlike a lot of social media monitoring programs, FriendFeed doesn’t cost you a thing (although some would pay for these features). Those are three powerful reasons you should be on FriendFeed. Right now. They don’t require you to get in there and apply Likes and comments to entries if that’s not your thing (that’s powerful in its own right, but more the province of social networks). But you will immediately start benefiting from what the service offers. Know anyone holding out or just unaware of FriendFeed? Send ’em this post. It’s awful, and I feel for those who were active users of the service. Just a reminder that there are a couple other services out there, and that by using one, you actually can have your bookmarks stored in two different places. If nothing else, the Magnolia issue should point you to the value of this strategy. So what are they? Diigo and De.licio.us. Once you set this up, add the Diigolet to your browser. Thereafter, save everything to Diigo, and a copy of each bookmark – link, title, tags, notations – will be saved to Del.icio.us as well. Double cloud coverage in Diigo and Del.icio.us. Can’t be too careful these days. Google Alerts Ain’t Working – Why Don’t They Use Attention Signals? #1: @VMaryAbraham so am I. Google alerts and blog search have been delivering really bad quality results lately. Old and spam. #2: Google Alerts actually sent me some useful info today instead of the usual mess of bizarre kitchen sink links from random years and places. One of my alerts is for ‘Enterprise 2.0’. I’m doing a pretty good job of staying on top of things in the Enterprise 2.0 Room on FriendFeed, but the Alerts are good back-up. And Google Alerts are the most common keyword notification service that people use. So this is my question: what determines the links we see in those daily Google Alerts? I ask this because of a recent experience with a well-received blog post that was not included in the ‘Enterprise 2.0’ Alerts. Compared to another post that did make it in to the Google Alerts, I find myself mystified as to what algorithm Google is using to generate its Alerts. The highlighted post is a schedule of Web 2.0 sessions for Lotusphere 2009. If you’re into Lotus, good stuff. One session at Lotusphere was titled “INV101 – From Web 2.0 to Enterprise 2.0: Collaboration, Productivity, and Adoption in the Enterprise”. Hence, its inclusion in the Enterprise 2.0 Google Alert. I use that entry as a contrast to a post I wrote on the Connectbeam blog, titled Three Silos That Enterprise 2.0 Must Break. It’s a post that pushed some definitions of what a silo is and where knowledge management needs to move to. It was well-received, with a number of attention signals like Del.icio.us bookmarks and tweets. And you’ll notice it’s not listed in the Alerts email above, or in any earlier ones. It was included in my ‘Connectbeam’ Google Alert. So I know Google had indexed it in its blog database. But it was not in the ‘Enterprise 2.0’ Google Alert. Which got me to wondering, what does it take for a post to make into the daily digest of Google Alerts? The table above includes some typical Google attributes: PageRank, term frequency, links. It also includes the next generation of content ranking: comments, bookmarks, tweets and Google Reader shares. On either basis, it’s surprising that the Lotusphere post made the cut, while the Connectbeam post didn’t. So I’m still trying to figure out what makes the difference here. Clearly, the Three Silos post struck a bit of a chord in the Enterprise 2.0 community. I know this not because of links by other bloggers (although they were there), but by the other Web 2.0 ways people communicate what’s of value to them. How about it Google? Time to update your algorithms to include attention signals from our growing use of social media? eBay was Web 2.0 before Web 2.0 was cool. I define Web 2.0 as the design of systems that harness network effects to get better the more people use them, or more colloquially, as “harnessing collective intelligence.” This includes explicit network-enabled collaboration, to be sure, but it should encompass every way that people connected to a network create synergistic effects. The impetus for Tim’s post was that people leave Google and its search engine off the list of Web 2.0 companies. As Tim writes, seeing the power of what Google’s search engine did was part of the notion of Web 2.0. This seems to have fundamentally altered Web 2.0. I’m reminded of a post that Allen Stern wrote back in July, CenterNetworks Asks: How Many Web 2.0 Services Have Gone Mainstream? In that post, he wondered how many Web 2.0 companies will really ever go maintream. Oh and you’ll have to add Gmail to the list as well. Look at those responses! You can see a massive disconnect between Tim O’Reilly’s original formulation of Web 2.0 and where we are today. One example I see in there: Gmail. Gmail is a hosted email application. Does Gmail get better the more people use it? No. There’s no internal Gmail application functionality that makes it better the more people use it. It’s just an email app the way Yahoo Mail is an email app. Being a web service and ad-supported isn’t, strictly speaking, a Web 2.0 company. Web 2.0 is slowly coming to mean everything. Which means nothing. Finally, Tim’s post helps me differentiate the times I should use “social media” as opposed to “Web 2.0”. What do you think? 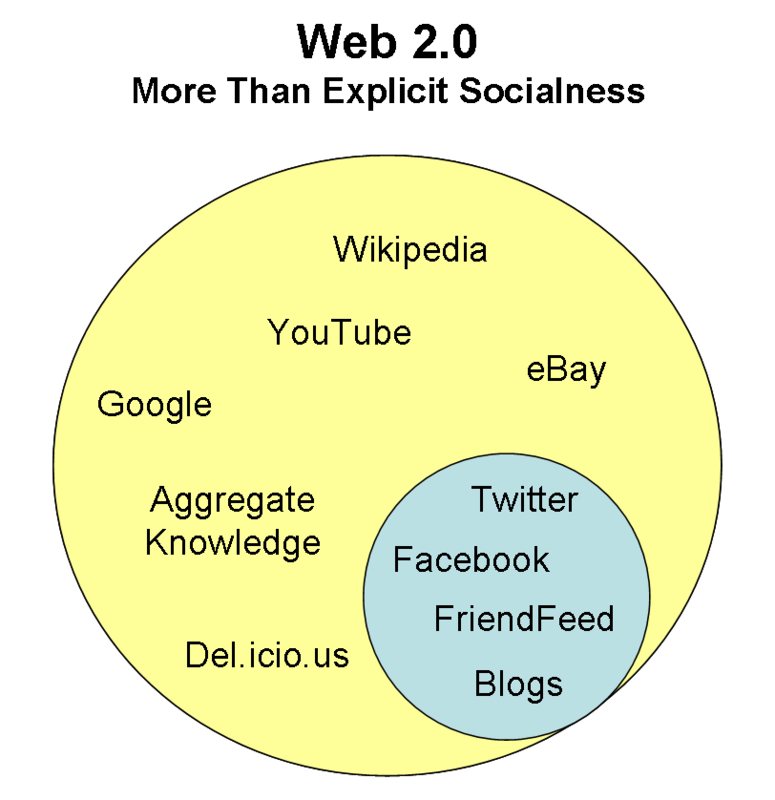 Should we go back to first principles in defining what really is “Web 2.0”?